Those who engage in contemplative practice know its positive effects, but documenting its value to others is not always easy. The Contemplative Collaborative will host a book talk on Friday, February 15, 2019 from 12:30 to 2:00 p.m. in Sims Hall Room 123 with Syracuse University authors who have contributed to a new volume, Empirical Studies of Contemplative Practices. The panelists will discuss how they research contemplative practice to better illustrate its value. 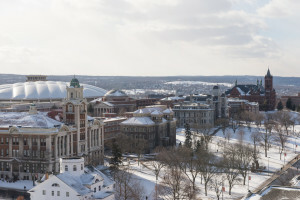 The event celebrates the book’s editors and authors from five Syracuse colleges, including the College of Arts and Sciences, Falk College, the iSchool, School of Education, and College of Visual and Performing Arts. There is a reception following the presentation. To request accommodations, contact Diane Grimes at dsgrimes@syr.edu or (315) 443-5136 by February 5. This event is supported by the Syracuse University Humanities Center and the Contemplative Collaborative. Co-sponsors include Communication and Rhetorical Studies and Writing Studies, Rhetoric, and Composition. Read more about the book and the discussion on the SU News website.